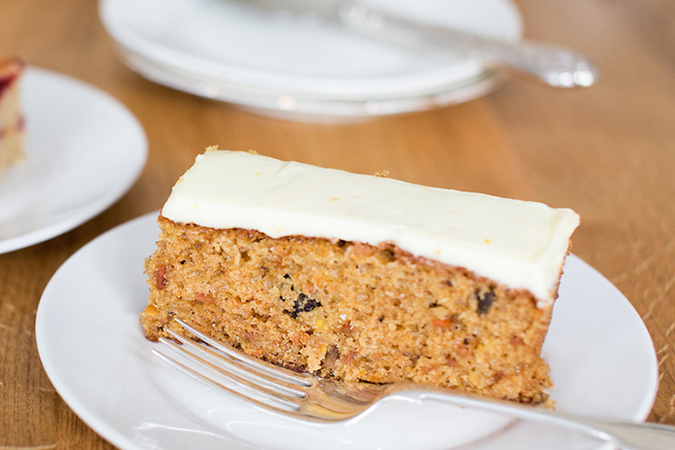 Our Award winning carrot cake recipe is made using 0.4 kg of freshly grated carrot in every tray. This oil based recipe is beautifully spiced and topped with a zesty cream cheese frosting. Iced and pre-portioned, this cake is ready to thaw and serve but you have the option to personalise it with your own sprinkles. We suggest a mix of walnuts and pumpkin seeds. Allergens handled in bakery: Milk, Egg, Soya, Treenuts, Cereals containing Gluten-Wheat, Oats, Barley, Rye, & Sulphites (source manufacturer may handle Peanuts). 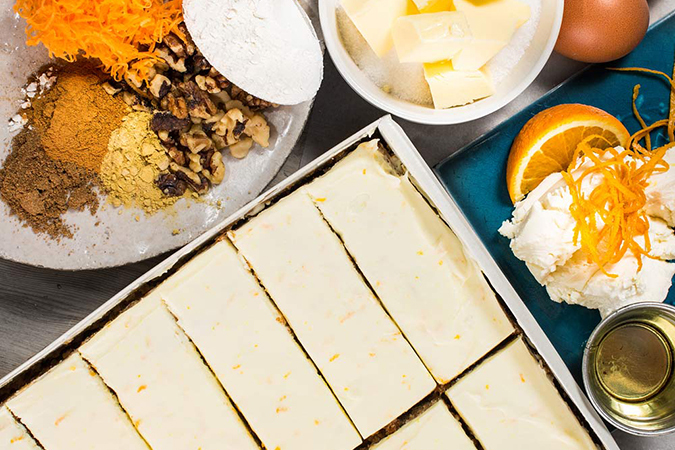 White Sugar, Icing Sugar (Sugar, Anti Caking Agent [E341]), WHEAT Flour (WHEAT Flour, Calcium Carbonate, Iron, Niacin [B3], Thiamin [B1]), Carrots, Sunflower Oil, Oranges, Free Range EGG, Cream Cheese (Whole MILK, Cream [MILK], Water, Salt, Locust Bean Gum, Citric Acid, Preservative [Potassium Sorbate]), WALNUTS, Salted Butter (Butter [MILK], Salt), Orange Zest, Raising Agent: (Diphosphates [E450], Sodium Carbonates [E500]; WHEAT Flour [[Calcium Carbonate [E170]; Iron; Vitamin B1; Vitamin B3]]), Sodium Bicarbonate (E500), Salt, Ground Cassia, Mixed Spice (Coriander, Cassia, Ginger, Fennel, Nutmeg, Clove, Cardamom).